2006 Plush Bear BOMBAY EXCLUSIVE - Easton with Scarf 18"
12 Cuddles - Stuffed Plush Teddy Bears. Item - Teddy Bear plush. LOT OF 12 VALENTINE'S PLUSHES. 7" Bear Plush Sparkle "Love" Heart. Decorated with a sparkle pierced nose jewelry, a lace heart shaped pillow decorated with embroidered "I love You" letters. 5 horses of alpaca wool. 10-14 inches approx. Material: Alpaca wool and skin. Suit for DIY, wedding gift, bouquet decor. Item Size: About 3cm-3.5cm From Head To Foot. 100 handmade andean animals, beers and alpacas, 4 inches approx. 100 Andean Animals. Material: Alpaca wool and acrylic. 100 handmade owl. Alpaca wool. 3 inches approx. Material: Alpaca wool and acrylic. I need two weks to make your order. (second class). 50 Andean Dolls. Material: Cuzqueña fabric. Material: Alpaca wool and skin. 20 Teddy Bears. Qty: 20pcs. Item Size: About 8cm. 25 Andean Dolls. Material: Cuzqueña fabric. 25 Andean Dolls. Material: alpaca wool, handmade. 150 handmade owl. Alpaca wool. 3 inches approx. Material: Alpaca wool and skin. 50 Teddy Bears. Material: Alpaca wool and skin. 30 Teddy Bears. Material: Alpaca wool and skin. 10 Teddy Bears. 25 horses of material alpaca wool, 12 inches approx. 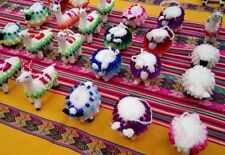 500 handmade andean animals, beers and alpacas, 4 inches approx. 500 Andean Animals. Material: Alpaca wool and acrylic. 250 handmade owl. Alpaca wool. 3 inches approx. 50 Andean Dolls. Material: alpaca wool, handmade. 25 alpacas. Material alpaca wool. 14 inches approx. 25 Alpacas. Material: Alpaca wool and skin. 100 Andean Dolls. Material: alpaca wool, handmade. 50 horses of material alpaca wool, 12 inches approx. 100 horses of material alpaca wool, 12 inches approx. Material: Alpaca wool and skin. 100 Horses. 50 alpacas. Material alpaca wool. 14 inches approx. 50 Alpacas. Material: Alpaca wool and skin. 100 alpacas. Material alpaca wool. 14 inches approx. 100 Alpacas. Material: Alpaca wool and skin. Material: Alpaca wool and skin. 100 Teddy Bears. 250 handmade andean animals, beers and alpacas, 4 inches approx. 250 Andean Animals. Material: Alpaca wool and acrylic. 100 Andean Dolls. Material: Cuzqueña fabric. 05 Alpaca Teddy Bears size 8'. Our collection includes a lot of Alpaca Silver jewelry with antique or modern stones and shells from our country and foreign. Our only purpose is to expand our culture through the artistic objects we manufacture. 12 Cuddles - Stuffed Plush Teddy Bears. Item - Teddy Bear plush. LOT OF 12 VALENTINE'S PLUSHES. 7" Bear Plush Sparkle "Love" Heart. Color - White color / pink and red heart. Decorated with a heart shaped pillow decorated with embroidered "Love" letters. 25 dogs of material alpaca wool, 10 inches approx. 100 dogs of material alpaca wool, 10 inches approx. 25 animals of material alpaca wool. Horses, dogs, alpacas. 10-14 inches approx. 25 animals: Alpacas, dogs, horses. Material: Alpaca wool and skin. 50 dogs of material alpaca wool, 10 inches approx. 12 Cuddles - Stuffed Plush Teddy Bears. Item - Teddy Bear plush. LOT OF 12 VALENTINE'S PLUSHES. 7" Bear Plush Sparkle " I Love You" Heart. Decorated with a sparkle pierced nose jewelry, a lace heart shaped pillow decorated with embroidered "I love You" letters. Our collection includes a lot of Alpaca Silver jewelry with antique or modern stones and shells from our country and foreign. 100% Quality & Handmade. Our only purpose is to expand our culture through the artistic objects we manufacture. Our collection includes a lot of Alpaca Silver jewelry with antique or modern stones and shells from our country and foreign. 100% Quality & Handmade. We have variety of models and different colours. Good condition, needs light cleaning.